1. This is a special POE adapter with 24V DC out, it can not Compatible with 802.3af(48v), please confirm your device is using DC 24v before you puchase this adapter. 2. 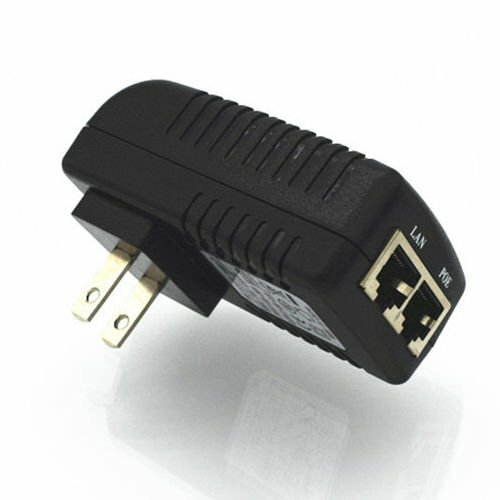 If you can not figure out the voltage of your device, we suggest you to buy 48v POE adapter which can follow 802.3af agreement. POE (Power Over Ethernet) refers to the existing Ethernet cabling infrastructure Cat. 3. It do not make any alteration of the circumstances, for a number of IP-based terminals (such as IP telephones, wireless LAN access point AP , network cameras, etc.) to transmit data signals at the same time, but also for the provision of DC power supply such equipment technology. 4. POE technology to ensure the safety of the existing structured cabling at the same time to ensure the normal operation of the existing network, minimizing costs. POE is also known as the power supply system based on local area network (POL, Power over LAN) or Active Ethernet.